the same day, but came back to us on Thursday 9th September 2010. 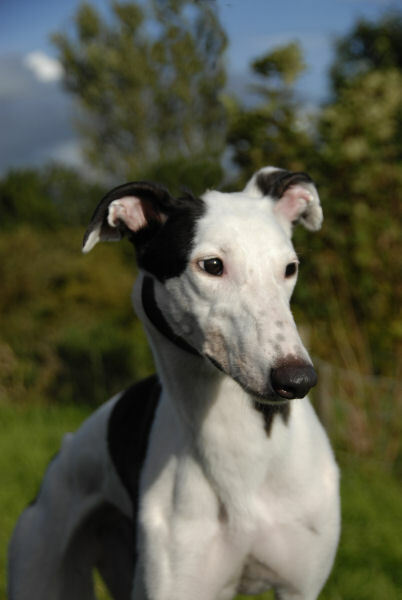 Dizzie is a small white and black greyhound who hasn't raced due to showing no inclination to run to her full potential. She was born on the 5th August 2008 and is house trained, inoculated, spayed and microchipped. She has a lovely, sweet nature and can't get enough love and cuddles and thinks nothing of climbing onto your lap and snuggle down. She walks nicely on the lead, travels well in the car and from what we've seen so far she is alright with other breeds of dogs. There is no mistaking Dizzie because of her slightly shorter tail, shortened by about 2 inches, but we don't know why. 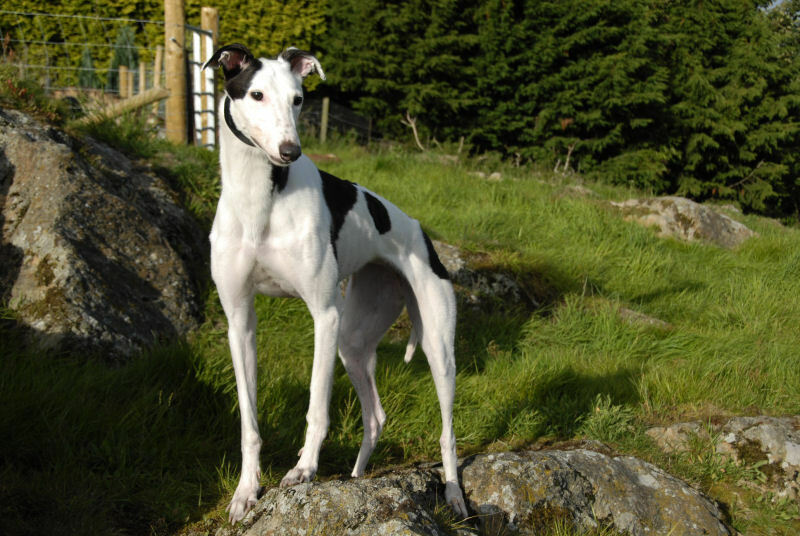 Stuart collected four greyhounds this morning, one of which was Dizzie. When they arrived home I'd already put ours behind the kitchen gate so all the new ones stayed in the kitchen, but before we brought them inside we walked them around the garden to do their toilet then fed them and walked them around the garden again. Back inside Stuart sat in the kitchen and did some work while I finished the guest bedrooms then I came down to help him. 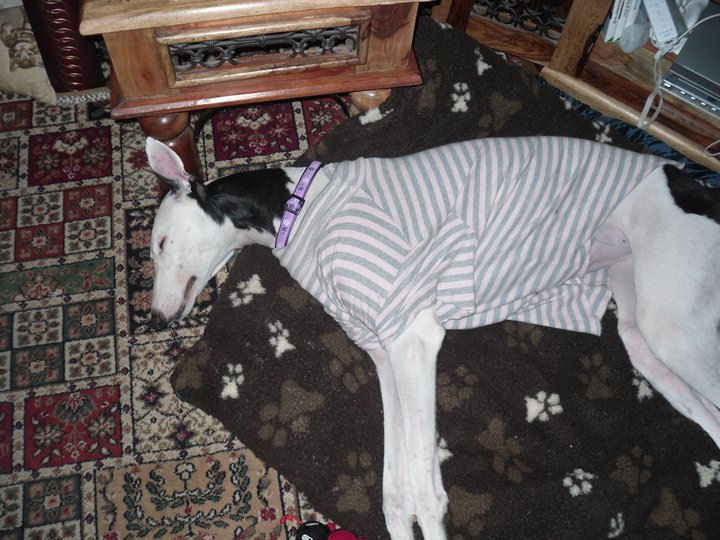 Having four new greyhounds in the house was rather hectic and thankfully doesn't happen too often. Dizzie loved exploring the garden and her tail never stopped wagging. You can't miss Dizzie because her tail is about two inches shorter than it should be, but we don't know what happened to cause her to loose the end. Jasper one of the other dogs who arrived this morning found her very 'tasty' because he wouldn't leave her alone. Dizzie couldn't be bothered with his advances and just did her own thing. 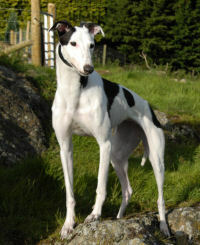 Just after lunch the couple who adopted Merlin called to see Dizzie with a view to adopting her. When the two of them met all seemed okay so she went for a walk with them to see how everyone felt about her. When they returned the verdict was to adopt her so the paperwork complete she jumped in the back of the car with Merlin and off she went to her new home where we hope she will have a long and happy life. We heard this afternoon that Dizzie had had a bad night last night and wouldnt settle but her new owners are hoping tonight will be better. There was one accident in the house but they expected that with her just coming from the kennels. There were also a few growls from merlin at first, but then that's an older dog putting a younger one in its place and after that they seemed okay. During their walk they walked nicely together. 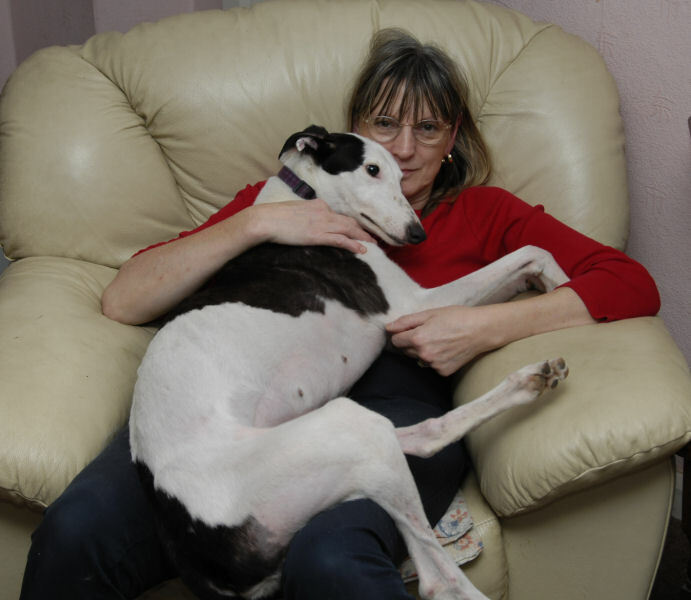 We received a phone call this evening to say Dizzie's new owners were experiencing one or two problems with her nervous energy around Merlin, their other greyhound who was finding her hard to cope with. As a result he was beginning to become withdrawn when Dizzie went near him. 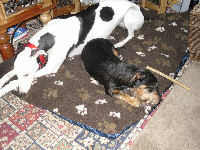 They said Dizzie had a lovely sweet nature, was walking better on the lead and showed signs of being okay with other breeds of dogs, although she hadn't been up close to any, she showed no signs of tension when around them. Merlin and Dizzie slept together, but Merlin felt unsure of Dizzie being near him when he was on the wooden floors. After a long discussion on the phone it was thought best for Merlin's sake that Dizzie come back to us and Merlin be given time to settle again. This lunch time Dizzie was brought back to us and as she arrived the moment Stuart was about to goshopping he took her and Solo with him so I could finish off the guest bedrooms. Solo went with her because of his calming influence and upon their return Stuart said she'd been fine in the car. What a sweet little cutie Dizzie is. She's no problem at all, walks lovely on the lead, eats her food well and loves being cuddled, to the extent she will come for a cuddle at every opportunity, and who could deny her that when she looks at you with those beautiful eyes of hers. She loves going in the pub and laps up all the attention she's given. Everyone, and I mean everyone loves her. She can often be found asleep next to Freddie or Blue. Has put Sam in his place a few times when he's decided she's too irresistable and makes advances on her and is so understanding of Freddie's predicament its uncanny. When I have a quiet five minutes with Freddie, which I do often during the day she will come for a quiet five minutes as well and will go and give him a little sniff and lick. She's beautiful, and I will miss her when she finds her forever home. The family who adopts Dizzie will have a wonderful companion to love and enjoy. Dizzie loves people and can't get enough of their company. This afternoon when I sat in one of the easy chairs in the living to have a chat to Stuart no sooner had I sat down than Dizzie was climbing on my lap. Greyhounds because of their size don't normally regard themselves as lap dogs, but Dizzie decided otherwise and once she was on and wriggled into place she had her photo taken then settled down for a nap. My five minute sit down ended up with me holding a large bony hot water bottle on my lap and after a bit of a fidget to begin with she made herself comfortable until I turfed her off for making my leg go to sleep! This morning we arranged to take Nicole for a cat test and because of Dizzie's character we decided to take her as well to see hoe she was with them. 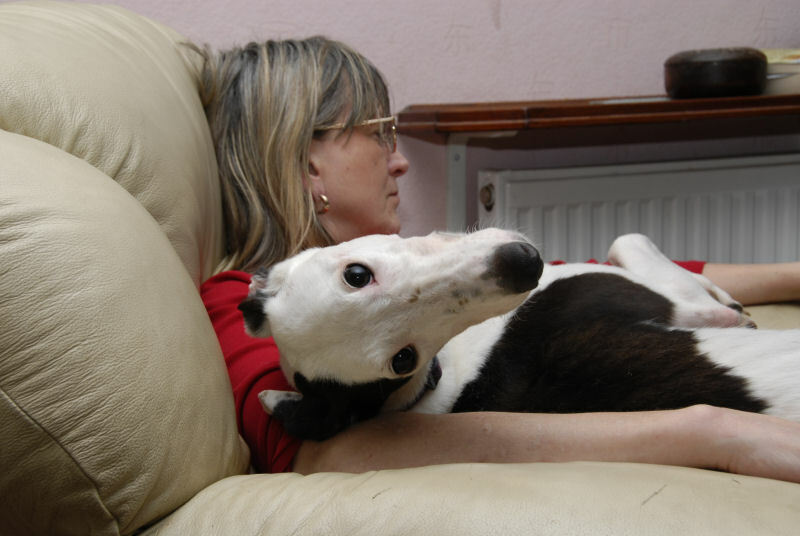 With muzzle on we walked her into the lady's living room and once she'd said hello to Thunder the greyhound whose house it is she was introduced to one of the cats. Having a look at the cat, the cat spat at her and she turned her head away in disgust as if to say ' so you don't want to be friends, fine!' and she walked away. After that she just wasn't interested in the cats and wanted to play with Thunder and his toys. 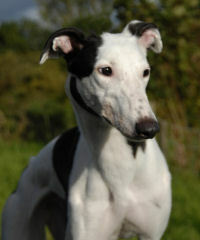 This lunch time Dizzie's potential new owners called to have a look at her and if okay to adopt her. They arrived with their daughter and small terrier and instantly fell in love with her and her them. As a result the adoption forms were completed and off she went with them to her new home where we hope she will have a long and happy life. about 15 minutes before settling down on the rug, until Amy decided to 'encourage' her to sit on the settee which she filled!!! They went for a walk and she was excellent on the lead, even passed a few dogs without a look. She ate a bit of dinner then relaxed for the rest of the evening. She went to bed around 10 pm with Amy and with all 3 of them walking her up the stairs (she seems to be getting the hang of coming down, but still a bit more time is needed on the way up) She climbed on Amy's bed and slept right through. When they opened Amy's door this morning Lizzy was so happy to greet them and after cuddles from all of them she had her breakfast of weetabix. No accidents at all in the night. Her new owners said It feels like she has been with them for years because she seems to have settled brilliantly and they love her to bits. not bothered about them and they were happy to stay out of her way, after hissing at her. We received an email this evening from Lizzy's new owner saying 'Thank you for your gift to us of "Lizzy", she is a fantastic dog and is so loving and so laid back. Once again thank you'. Receiving this email cheered us up no end and we are so pleased she has found her perfect home. It's been a hard few days especially as she was re-homed the day after Freddie died so having two leave so close together wasn't easy especially as Lizzy is a 'people' dog and wants to be with you all the time, which is what we needed after Freddie died. We received an email from Lizzy's owners letting us know that Lizzy has been watching the cats now since last week and hasn't really bothered with them until yesterday. One shot through the lounge and Lizzy flew off the settee in full chase through the kitchen and garden after the cat, but the cat was too fast! The little minx, her new owners think she was a bit bored at the time and hey presto, cat = entertainment! We received an email today letting us know that Lizzy has nearly got over her stomach bug and is back on her normal food. She is sleeping through the night again so having to get up to let her out 4 or 5 times a night with her bug was like having a baby again!!! 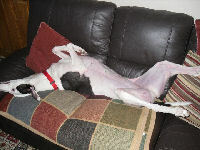 We received an email today letting us know that Lizzy has settled in brilliantly. Recieved an email this afternoon to letting us know that Lizzy had just pinched the pork crackling off the kitchen work surface just before her owners were about to sit down for their Sunday lunch! 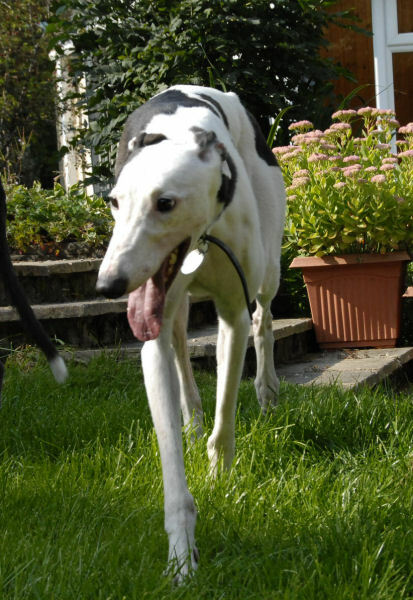 Lizzie and Poppy came to visit today and had a great time running round the garden with the other greyhounds. 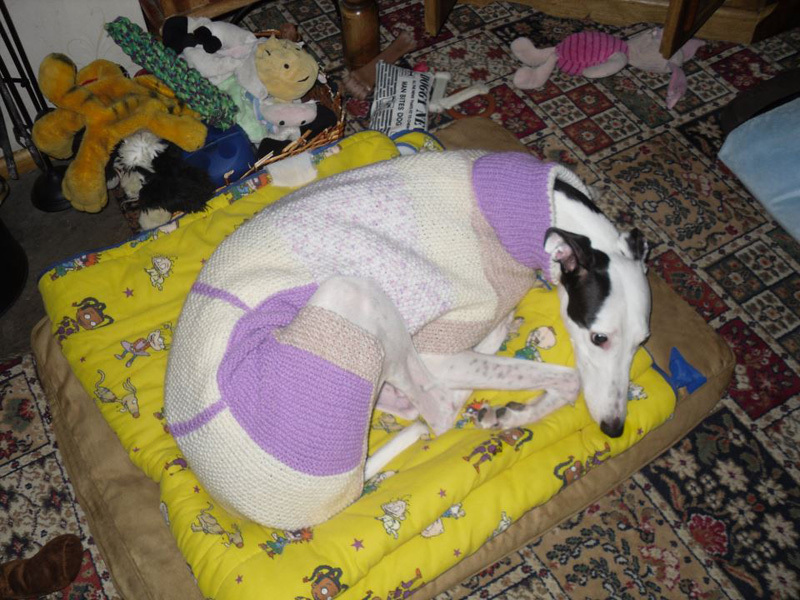 Lizzy's owners bought her a new knitted snuggle coat to help keep her warm now the cold weather has set in, and they sent us a photo to show us how posh she looked. 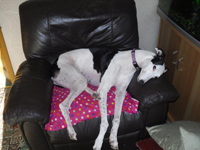 We recieved a picture today of Lizzy having a nap in her new chair! Received an email letting us know that yesterday on a walk Lizzy urinated and at the end there was some blood. They rushed home to call the vet and the receptonist made an appointment for tonight and said it was probably cystitas. 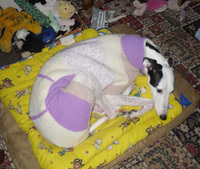 Lizzy's owner was worried, she is eating and drinking nomal and is her normal happy self. Her owner went outside last night with a tuppa ware tub for'a collection' of urine from her and again right at the end blood appeared.
. . . and again . Lizzy in her new chair!